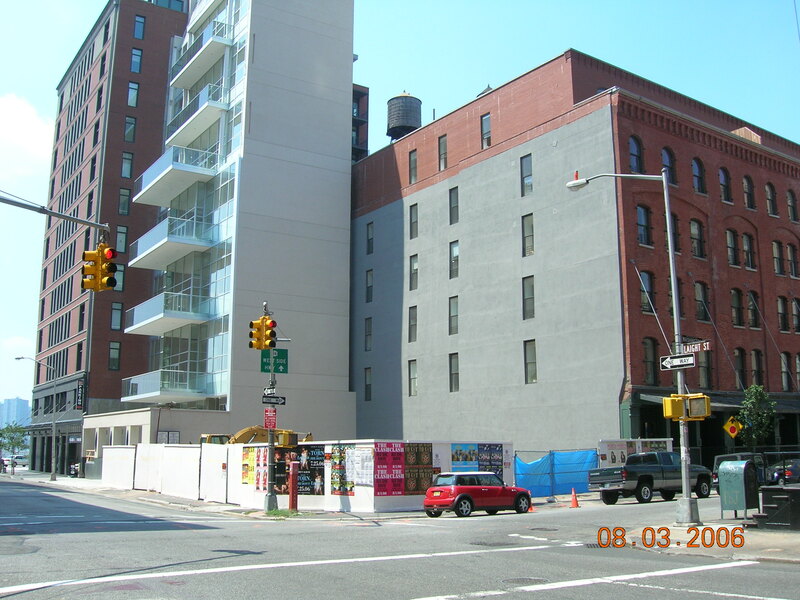 Site of new 260,000-square-foot residential development at 88 Laight Street in North Tribeca. Photo: Shane Tattan. A private developer sought to rezone four city blocks of Tribeca. Truffles, LLC applied for a zoning map amendment to rezone four waterfront blocks along the western edge of Manhattan’s North Tribeca neighborhood to enable construction of a 260,000-square-foot residential development at 88 Laight Street. Truffles also applied for a text amendment to increase the maximum streetwall and building height restrictions, and a special permit to replace an existing 43-space parking lot with a 180- space underground garage. The area, bounded by Washington Street to the east, West Street to the west, Watts Street to the north, and Hubert Street to the south, is characterized by a mix of commercial, residential, automotive, and industrial uses. The two northern blocks comprise mainly low-rise and underdeveloped properties such as surface parking lots, automotive repair shops, warehouses, loft residences, and a restaurant, while the two southern blocks – both located within the Tribeca North Historic District – include 9- and 10-story residential buildings and an 11-story office building. While sections of Tribeca have become thriving residential communities, the four blocks in the proposed rezoning area are located in a subsection of the Special Tribeca Mixed Use District that prohibits new residential development. In its application, Truffles requested that these four blocks be rezoned from an M1-5 light manufacturing district to C6-2A and C6-3A districts, which permit residential development of 6.02 FAR and 7.52 FAR, respectively, as well as a range of commercial, retail, and community facility uses. Truffles also requested a text amendment to extend the maximum streetwall and building heights on West Street from 102 and 145 to 150 and 160 feet, as well as to modify the bulk regulations for lots over 30,000 sq.ft. The proposed text would prohibit certain uses, including large-scale entertainment venues, ground-floor retail spaces, and eating and drinking establishments with capacities greater than 200 persons, except in buildings that front West Street. At the Commission’s June 7, 2006 public hearing, Manhattan Borough President Scott Stringer appeared to oppose the application, warning that a piecemeal approach to rezoning North Tribeca would jeopardize the neighborhood’s unique historic and waterfront character. Julie Menin, Community Board 1 Chair, called the proposal spot zoning and urged the Commissioners to consider a comprehensive plan. Community Board 1 also expressed concerns about traffic, infrastructure, noise, and other environmental consequences. Several residents and business owners, including Richard Sloane, who described himself as a “NoHo refugee” driven out by overdevelopment, raised concerns that the proposed rezoning would block light and air. Some residents supported the rezoning. Roy Hayes, a 30-year Tribeca resident, expressed optimism that more residential units would attract small shops and businesses back to the neighborhood that had left the area after 9/11. Truffles argued that new residential development would allow the rezoned blocks to better reflect the current mixed-use character of the surrounding neighborhood. Elizabeth Unger, a resident and real estate developer, indicated the need for housing to accommodate growing families who wish to stay in Tribeca. Truffles also noted that a majority of buildings within the rezoning area exceeded the existing restrictions on building size (FAR) and would be brought into compliance by the proposal. current designation had become obsolete. The Commission approved the special permit for parking but, noting that the requested variation on streetwall height was not warranted, modified the application by reinstating the existing maximum of 102 feet. Explaining her vote in opposition, Commissioner Cavaluzzi argued that the Commission had the opportunity to shape the area with a more detailed proposal that could better preserve North Tribeca’s unique buildings and serve as the front door to Tribeca.